BBP: Alex, What is a fork and knife? Alex, What is a fork and knife? 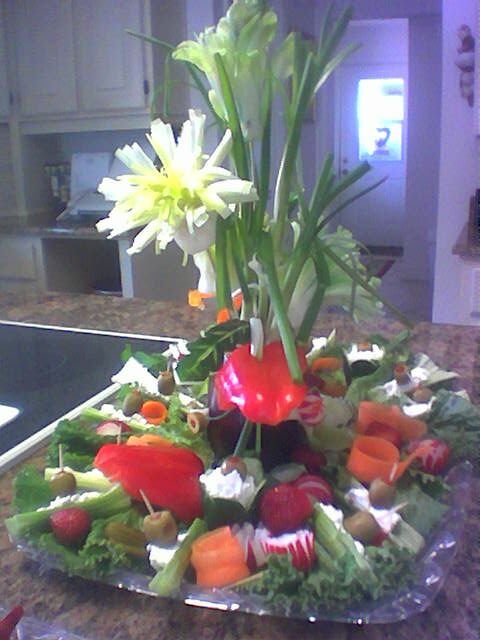 Question, What garnish do you use to make your meal look attractive? O.K. Maybe that's just the way I feel, but I really don't usually spend a lot of time on garnishing my meals - unless there is company coming. So Gerre thought she could help remedy this for us all. Her theme this month was "Garnishing", but I also heard someone else call it "Embellishment". I guess that is a Southern term like "Glow". You know (same meaning - different term), we belles don't 'sweat', we "glow". But back to the topic at hand. And I am thinking....boy, they would really have to be SPECIAL COMPANY! It is absolutely gorgeous and looks like a lot of cutting! She also had a tray prepared for our examples. 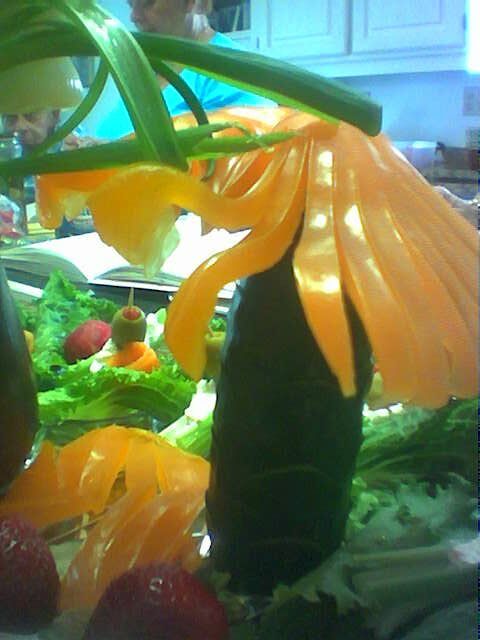 But my favorite was this pepper and cucumber palm tree. 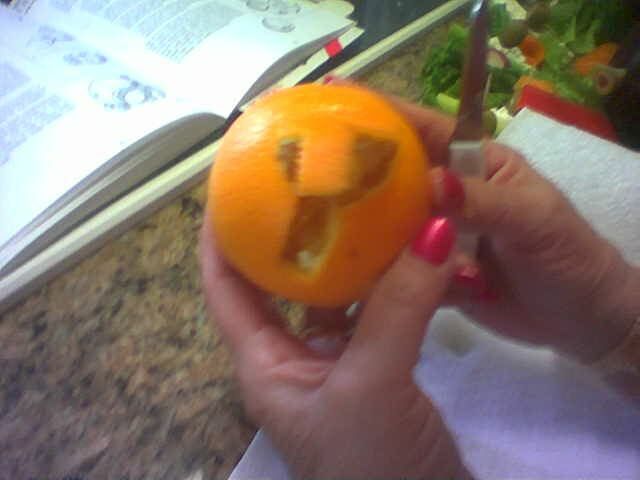 Gerre asked us if we wanted any 'hands on' experience so I tried the Frog Egg and Carol tried the Orange Elephant. 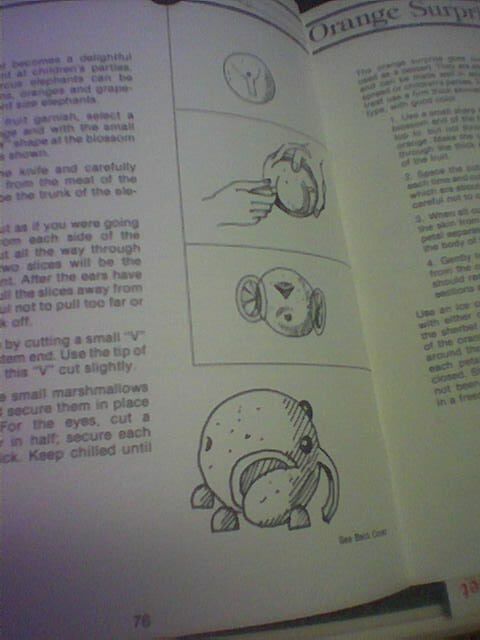 Gerre used a garnishing instructional book for us, but I doubt with her skills and experience, she would hardly ever have to reference it. 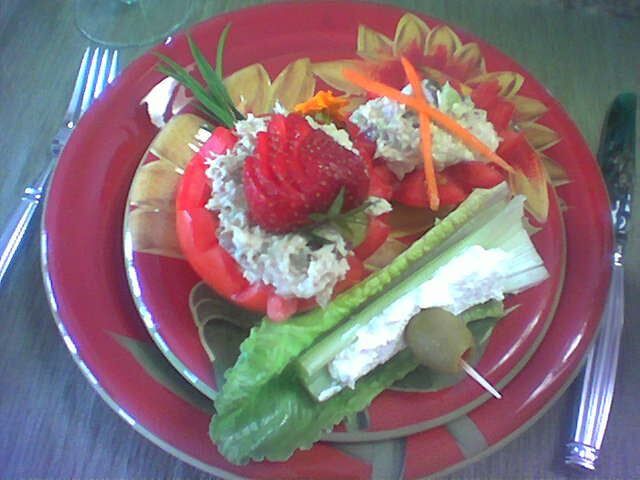 Afterwards, we enjoyed a wonderful chicken salad served in a garnished tomato and then no bake cheesecake with fresh peach glaze. Thanks, Gerre - a great time was had by all. 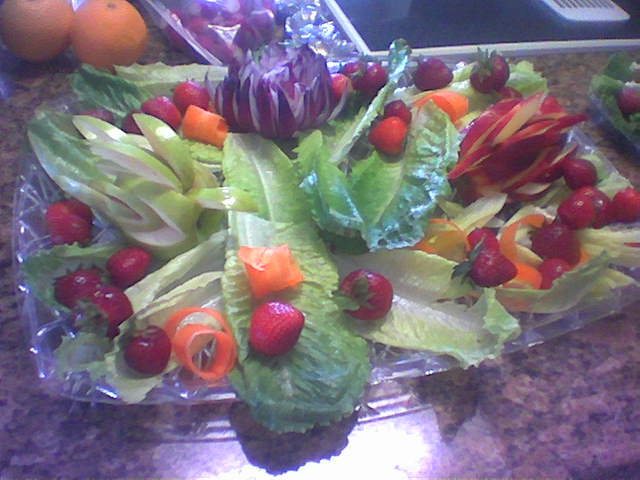 PS - You can click on the thumbnail pictures of the garnishes that follow to get a bigger picture.